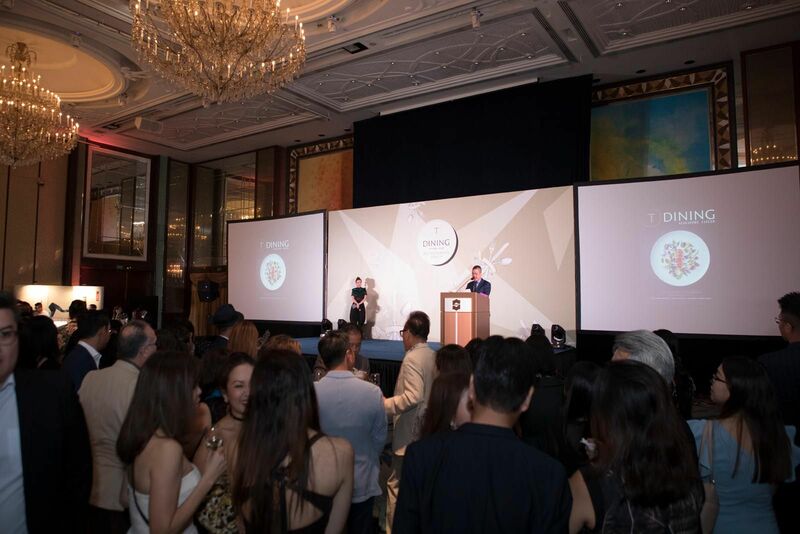 It was an expected feast of fine foods and revelry as the island’s top chefs, sommeliers, restaurateurs and career gourmands gathered at the Shangri-La Hotel Singapore’s Island Ballroom for the T.Dining Best Restaurants 2018/19 Awards, cheered on by their peers and fans. Sponsored by HSBC Visa Infinite, the evening celebrations, hosted by radio personality Yasminne Cheng, were made extra special with the reveal of T.Dining’s inaugural list of Singapore’s Top 20 Restaurants. As it was explained to the curious crowd, earning a place among the 223 restaurants to make this year’s list of best restaurants in Singapore is no mean feat. But the T.Dining team understood that there was a need to spotlight restaurants that don’t only tick all the boxes, but that have also managed to surpass the expectations of the most discerning of diners and deliver that something extra—be it a uniquely progressive interpretation of a cuisine or an inspiringly elevated dining experience while displaying the potential to offer much more. In short, it wasn’t a vote that was left to one or two critics, or a single experience; months and several rounds of deliberation and voting by the T.Dining panel were needed to narrow this year’s picks down to this select group. Guests cheered on their favourite restaurants as did fellow chefs who displayed inspiring camaraderie. “It is such an honour, and you guys throw an amazing party,” shared Ivan Brehm of Nouri, last year’s Best New Restaurant awardee and one of this year’s Top 20. Veteran chef-restaurateur Beppe De Vito, whose Top 20 restaurant Braci also took home an award for Best Service, also affirmed how honoured he was to be included in such good company. The champagne—specifically the official sponsor Laurent-Perrier’s La Cuvee Brut—likely had a part to play, but there was a clear buzz in the air, as guests tried to capture a memorable shot on their mobile phones. They were also hungry to savour the feast that followed the presentation of Singapore’s Top 20 Restaurants, and the excitement promptly shifted to the food booths, strategically located in the centre of the ballroom. A queue quickly formed at the Origin Grill booth where the always upbeat chef de cuisine Heidi Flanagan was serving her signature dish of charred octopus with Moroccan inspired tomato jam and eggplant caviar, and, of course, the Williams River wagyu beef, this time with a little tangy-spicy Thai dipping sauce, vermicelli and roasted rice. She had even included her a popular starter of tuna sashimi served over a flaxseed and vegetable house cracker with a little avocado, jalapeno and hummus. Perfectly grilled meats and seafood are almost always an expected hit, and familiar hits were aplenty at restaurant Tandoor’s booth, which showcased, among others, murgha tikka (cubes of chicken marinated with red chilli, yoghurt and spices) and spiced minced lamb rolls flavoured with fresh herbs and spices, all skewered and grilled in the tandoor. Suffice it to say, they went down well with a freshly pulled glass of Peroni beer. For a taste of modern Chinese fare, Xin Cuisine once again impressed with its mouth-watering variety, from a pairing of chilled tuna with black pepper in an avocado sauce, pork jelly with vinegar, and naked baby abalone tart, to a yam and mushroom dumpling, and the traditional crispy barbecued pork. These were conveniently located close to the Laurent-Perrier and the Dark Horse counters. The latter served up an elegant pair of Californian wines, including a bold yet easy to drink 2016 cabernet sauvignon, driven by flavours of blackberry and cherries and just a hint of spice. Alternatively, a crisp yet luscious but not too oaky chardonnay was served. Delicious surprises abound, especially at the soon-to-open contemporary Japanese restaurant Omote’s booth. Guests lapped up a preview of its menu, which included imaginative dishes such as the Uni Martini—sea urchin and salmon caviar in a white truffle sauce—as well as a spicy shrimp sushi rolled with otah; and a serving of crayfish noriten. Equally exciting flavours were ample at the Patara Fine Thai Cuisine booth where bite-sized savouries such as scallops with chilli jam, tok kor-style grilled kurobuta pork, and slow-cooked wagyu beef cheek in a special curry, were some of the more popular picks. Guests had their cravings satiated, even if they were digging Wolf Burgers’ beef sliders with “truffled” mushrooms or, for that matter, its Beyond Meat alternative. There was even ice cream by another friend of T.Dining, Kindred Folk, because everyone loves ice cream. Everyone also agreed Odette was a deserving winner of this year’s award for Best Interior Design and one of the restaurants to make it onto T.Dining’s inaugural annual list of Singapore’s Top 20 Restaurants, many of which were also recipients of an individual award. They include Gunther’s, which took home the award for Best Service, while Candlenut’s Malcolm Lee was named this year’s Local Champion. New addition Shigeru Koizumi’s Esora also bagged two awards—one for making it into the Top 20 and another for Best New Restaurant. The former is chosen by our panellists from establishments that are less than a year old at the time of judging, and Esora impressed with its finesse and forward-thinking micro-seasonal approach to celebrating Japan’s finest. The awards ceremony closed with yet another four restaurants being inducted into the Best Restaurants guide’s Hall of Fame, and they were Cherry Garden, Corner House, Saint Pierre and The White Rabbit. It was certainly no mean feat as each restaurant would need to have received at least nine points for food in this year’s guide, and 32 points across the four categories (setting, food, wine and service) for a consecutive four years. Also new are this year’s trophies, an aptly celebratory combination of a specially engraved plate by Selangor Pewter and a bottle of Laurent-Perrier Brut Cuvée Champagne Rosé.